I mean the title on this post rather more literally than usual. My bike went on an adventure without me when my friend and local bike culture luminary Kent Peterson borrowed it back in July to mark part of the course for the Seattle Century. Read his account here. And if you have problems with the embedded slide show like I do, you can see Kent’s pictures here. Sightline drew attention today to an article that points out that for an expensive stretch of road, the cost of building the road cannot be recovered from the gas taxes generated by traffic on that stretch of road. It’s kind of a specious argument since road funding is kind of like insurance where the cost and benefit are spread across the entire network so asking that every subset pay for itself is naive at best. But the idea that gas taxes pay for roads is one that comes up frequently in discussions of transportation equity especially between car folks and bike folks. The argument is that people who primarily ride bikes aren’t entitled to use the road network because they don’t pay gas or vehicle taxes. The fact is that while those revenue sources do contribute to road funding, they are far from the only source. Roads are funded from a complex array of sources. And the real kicker is that it’s different for every state. Here in the northwest, if you look at funding sources for just local roads and streets you might be forgiven for believing that vehicle-related taxes pay for your roads. In Idaho, Montana, and Washington, 95-100% of local streets are paid for with vehicle and fuel taxes. In California, only 59% with the remainder coming from the general fund. In Oregon, only 47% of the funding comes from fuel and vehicle taxes with the remainder coming from federal sources. However when you look at highway funding, you find that here in the Northwest less than 50% of funding comes from gas and vehicle taxes. The rest is made up from a melange of other sources: state general funds, bonds, local government funds, and especially federal funds. What those sources of revenue have in common is that they predominantly come from the pockets of drivers, cyclists, walkers, and bus riders alike. Clever Cycles sells cargo and city bicycles and related gear in Portland. I visited them about a year ago just after they first opened the store. I just heard that they’re closing. Not for good, just for a two-week vacation. In the middle of summer. A bikeshop. Are they insane? Turns out it’s not lack of sanity, it’s lack of bikes. They’ve been doing so well they’re sold out of all their bikes. How cool is that? 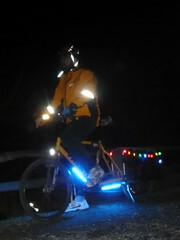 David Longdon of the Seattle cycling blog Velocity has run a contest for the last two months for the “Most Visible Night Cyclist”, and I won for December! I’m sure it’s the star Christmas lights that pushed me over the top. A couple of weeks ago I was walking home from the rental car place after returning a car. It’s about a two mile walk and along the way I thought about transportation. Part of the reason I was walking was that I missed the Metro 200 bus by about a minute so it was going to be a half-hour wait for the next bus. This minor frustration made me think of all the other minor frustrations associated with any method of transportation other than getting in your car and driving. It occurred to me that these small things make a big difference in our choices of how to get around. So as I walked I tried to see small impediments to my walking and think about how they might be removed. That bench would be a nice place to rest only it’s covered with moss and blackberry brambles. I could cross this street if only the crossing signal button worked. It would be easier to get to that grocery store if there had been a sidewalk included in this parking lot. A lot of these things are theoretically the responsibility of the city’s maintenance and design staff. But I have talked to some of those people and I know that they are all overworked and overwhelmed. Walking and cycling are sort of fringe concerns when you’re designing a road intersection or a shopping center. There just aren’t enough of us to make the effort worthwhile. I thought about getting the city switchboard on speed dial on my phone so I could bring these things to their attention as I see them. But I can see where that’s going to lead. “Oh no, it’s Youngstrom on the phone again with another crossing button on the fritz.” Some of the things I could just fix. It would be easy to go clean off that bench. But some require either help from the city or vigilance in design reviews. So I thought about how I could keep from being a simple annoyance. What I came up with was that if I was a representative of a group who share my concerns about non-motorized transportation then my gripes might hold more weight. And if there was a group, maybe I wouldn’t be the only one complaining. But there isn’t a group. You see where this is going? I decided to form a group. I thought about it for a while and the thoughts had that fun sparkly feeling about them. Ideas kept coming. I kept jotting them down. Pretty soon I had a big pile of thoughts and I was still excited about it. Me. Excited. Clearly this is something I should pursue. So I came up with a name with a cool acronym. It’s GAIT for Getting Around Issaquah Together. I registered a domain: http://gettingaroundissaquah.org/ and today I put a blog there. For now it’s just me. I’ll use the blog to talk about my ideas for what the group should be and do. I’ll talk about my initial forays into addressing those small issues that make walking and biking harder than it should be. If more people are interested then maybe I’ll take the next step and make it a real organization. If you want to watch me stumble down this new path then add http://gettingaroundissaquah.org/ to your reading list. There was a surge of publicity a while back about the concept of Peak Oil (the point at which production begins declining as supply dries up). Could it be that we’re coming to the point where people are going to start to realize that we’re heading for a similar precipice in the life of the individual automobile. These energy and resource intensive conveyances are just too inefficient for them to survive as our primary method of transportation for much longer. And making them electric doesn’t help that much. You still need roads and parking lots and garages and factories and repair shops for individual cars regardless of your fuel source. What makes me wonder this now is that Orson Scott Card, who’s usually a bit of a wingnut has posted a piece called Life Without Cars (via). Bought the red bike in the picture today. Love the Trek with the Xtracycle, but needed something more minimal for times when I don’t need to haul anything. 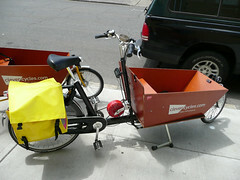 In particular, the Xtracycle doesn’t fit on the bike racks on buses without some finagling. The new bike proved itself right away cause I rode the bus over to Bellevue to take possession from its previous owner and brought it back on the bus. 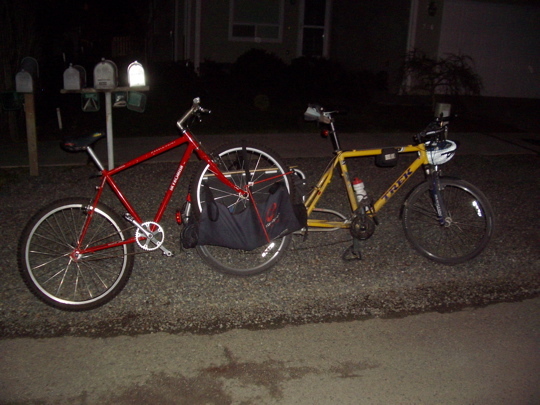 Then towed it home from the park and ride with the Xtracycle. It towed so well I had to look back a couple times just to make sure it was still back there. This is the second incarnation of Mad Times. To see posts from the earlier incarnation, follow the links below.